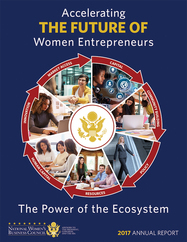 Today, December 7, 2017, the National Women’s Business Council is pleased to share with you the Council’s Annual Report for Fiscal Year 2017: Accelerating The Future Of Women Entrepreneurs – The Power of the Ecosystem. This year, the National Women’s Business Council celebrates 29 years of advising the White House, U.S. Congress, and the U.S. Small Business Administration on issues of impact and importance to women business owners. We have convened the best intellect and experience to address challenges that faced women business owners and leaders in 1988 and that still face women in 2017, and we have executed the most ambitious research portfolio in the Council’s history. We have contributed important information on private markets, expanded the definition of necessity entrepreneurship for a business origination, redefined an effective entrepreneurial ecosystem framework, and piloted a regional solutions lab model, helping women business owners succeed. As we look ahead to changes in industry, markets, and labor, we invite all champions of women’s business ownership to join us in accelerating the policy of tomorrow, meeting the needs of women entrepreneurs in the economy of the future. A look ahead to new research agenda that the Council will pursue for Fiscal Year 2018. You can read and download the Council’s FY2017 Annual Report, Accelerating The Future Of Women Entrepreneurs – The Power of the Ecosystem, on our website here. We hope you will join us in spreading the word by sharing it with your networks. In conjunction with the release of our FY2017 Annual Report, the Council will be hosting its December 2017 Public Meeting today at 2:00 p.m. ET. 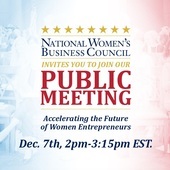 The public meeting, which will take place via webinar and conference call, will offer an update on NWBC's research and engagement activities in the first quarter of Fiscal Year 2018, a glimpse at highlights from its FY2017 Annual Report, and a keynote from a representative of the U.S. Small Business Administration. If you are interested in tuning in, it is not too late! The conference begins at 2:00 p.m. ET; you may join 10 minutes prior. Step 2: Instructions for connecting to conference audio will then be presented on your computer. * If you are unable to connect to the conference by computer, you may listen by telephone only at 1-877-369-5243 or 1-617-668-3633 using 0255586# or Find an Alternate Number. We also invite you to join the conversation online using #FutureofHerBiz on Facebook, Twitter, and Instagram. Thank you for your support this past fiscal year. Again, to learn more about the Council’s FY2017 research, engagement, and policy recommendations, take a look at our brand new annual report and join today’s conversation at 2PM! *If you will be connecting via the AT&T Connect Participant Application, we strongly recommend you install a current version (11.5 or higher) prior to the conference. If you are unable to do so, we recommend you join the conference using the Web Participant Application. If you need technical assistance, call the AT&T Help Desk at 1-888-796-6118 or 1-847-562-7015.